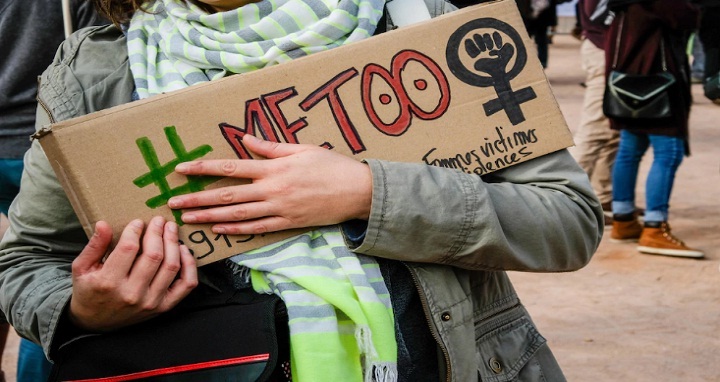 A protesters holds a placard reading #Metoo during a gathering against gender-based and sexual violence in Lyon on October 29, 2017. #MeToo hashtag, is the campaign encouraging women to denounce experiences of sexual abuse that has swept across social media in the wake of the wave of allegations targeting a Hollywood producer. (AAP Image/NEWZULU/Franck CHAPOLARD). France, Lyon, 18 Dec, Abnews: You’d think with the recent coverage of the Harvey Weinstein and Don Burke allegations that men would rein in the lewd ehaviour. Just ask a waitress, bar worker or corporate staffer. Comments on the appearance or clothing of a woman in the workplace, or as a customer, are not appropriate. It is not a compliment, it’s creepy. It’s not light-hearted fun, it’s demeaning. It may not be criminal, but it’s inappropriate. Compliment someone on their work, not their looks. If you’re out there making snide remarks or giggling with your blokey pals about a woman walking by, or serving you, grow up. Your daughter, sister or mother would be ashamed of you. Surely these types of men are now reconsidering their actions in the wake of the #MeToo campaign which has caught out Matt Lauer and other prominent figures. The real result will be if there are genuine consequences for these men and some feeling of justice for the women who put up with their immature and creepy behaviour. The #MeToo movement has shone a light on why many industries are still dominated by men.